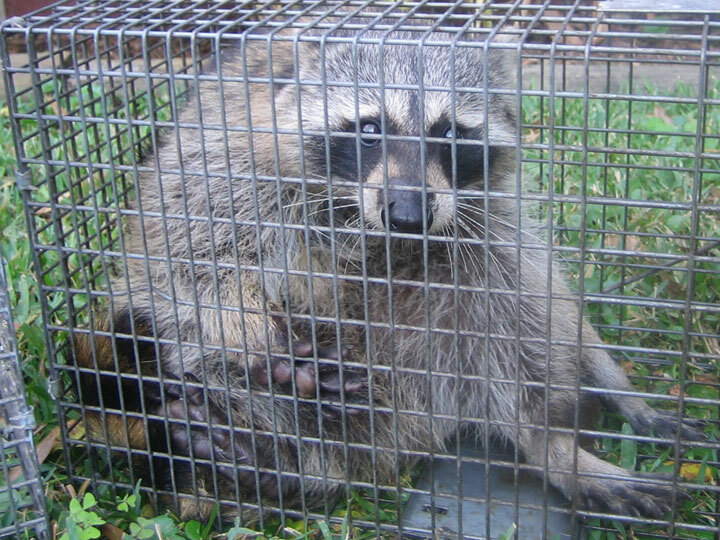 01.13.2007 - This is one of the fattest raccoons that I've ever caught. Interestingly, in the cage on the left, out of the photo is the actual fattest raccoon that I ever caught. However, I decided to feature only a photo of this one, because I like how it is sitting. It looks like a lazy blob, like Jaba the Hutt or something. The one in this photograph weighed 22 pounds, and the one next to it was 29 pounds! These sizes are very large for Florida raccoons, which rarely exceed 15 pounds. Up north, raccoons this size are more common, and can even reach up to 50 pounds, but in FL mammals tend to the smaller sizes for better heat dissipation. Neither of these raccoons was particularly large overall, just very round and plump. They were both males, and not pregnant of course. I caught them using marshmallows, though by the size of these specimens, it's my guess that someone has been feeding them. It's possible that they've been raiding garbage cans or pet food, but I'm guessing that they got this fat from a steady stream of kibble left out by a cat collector or other animal nut. While it's fun to feed wild animals, it's ultimately harmful in the long run. I trapped and removed these raccoons because they were pooping in the customer's pool. This is a very common raccoon behavior. I simply set traps next to the pool steps, bait them, and voila! I relocated these two fat raccoons, and I'm guessing that some leaner times lie ahead as they find new food to forage.